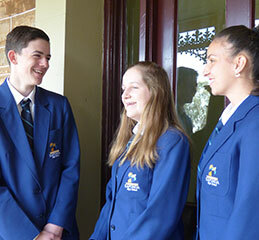 Prefects are elected from Years 10, 11 and 12 and Student Representatives from Years 8 and 9 by students. Prefects and Student Reps have a very responsible position in the school, being participants on the Governing Council, on various committees and being involved in the routine administration of the school. They also represent student interests to staff, and are actively involved in raising funds for the school and charities. The Head Prefects, in particular, are often called upon to speak in public and represent the school at community activities.